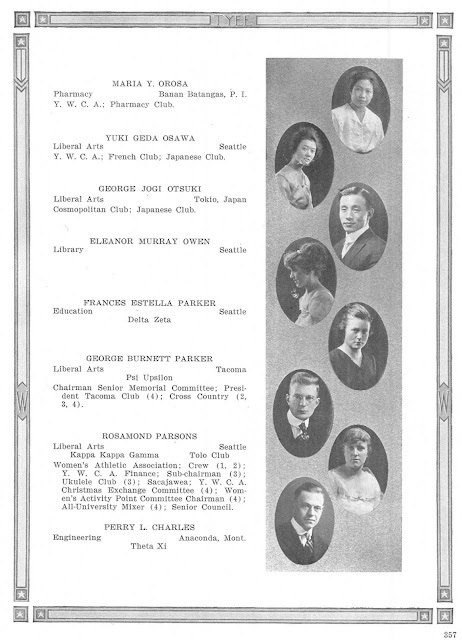 Maria Orosa (top) photo in the 1918 University of Washington yearbook. Image source: University of Washington Digital Library. Soon after the United States took over colonial administration of the Philippines in 1898, it started a program of sponsoring talented Filipino students to study in America. The purpose of this was two-fold. One, it reinforced the idea of America’s benevolent colonial administration in the Philippines. Second, by sending Filipinos to the United States, the Americans were giving these young people the opportunity to understand western culture better and, it was hoped, make them more supportive of the American presence in their country. Among the thousands of students who availed of this sponsorship was one Maria Ylagan Orosa of Taal, She was a Pharmaceutical and Food Chemist who earned her degrees from the University of Washington at Seattle. Although she undertook outstanding research work in food preservation, she is best remembered for her creation of Soyalac, a high-protein diet based created from soya beans that was fed to inmates in Japanese prisoners-of-war camps; and the banana ketchup, by now a ubiquitous presence in Filipino households. The photograph above is a page of the 1918 University of Washington at Seattle yearbook. The previous year (1917), Orosa had already obtained a Bachelor of Science in Pharmaceutical Chemistry degree from the same school. For this year, she was included in the yearbook for earning a degree in Food Chemistry. The reader will please note that she was listed as from “Banan” in Batangas, which was obviously a typographical error. Although born in Taal, her family must have moved to Bauan where her mother “operated a general store1. 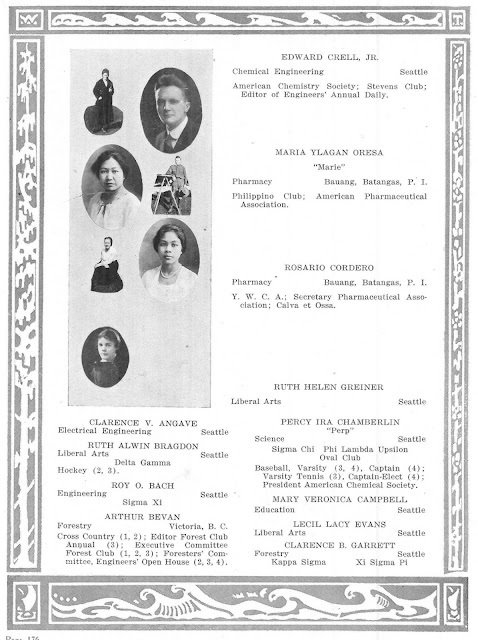 Below, the page of the University of Washington at Seattle yearbook of 1920 with Orosa after she earned a Bachelor’s degree in Pharmacy. Maria Orosa, second from top, after earning a BS Pharmacy degree at the University of Washington. Image source: University of Washington Digital Library. 1 “Maria Y. Orosa: Pioneering Food Technologist and Inventor,” online at Cite Seer X.